I can never remember if I've bought a memory foam topper!!! Bit big for a puppy training pad. I think the foam is 3cm the teddy bear cover is the extra thickness. I am not sure if it is 5.7 cm or 3 cm as in specification it suggested of 5.7 cm... has anyone owned it can confirm? Reserved a couple as well as memory foam pillows and duvets!! How good is it? And deep? I.e. 5/6 cm? Well Kingsize was £27, but I couldn't see the price of single or double, so I'd imagine single being around £15-£18 which at half price is about £8-9. Any idea price of a single? The height/depth is 5cm in case anyone else looking for it. Yes, I put up this deal because I was ordering a second one for another bed in my house. I’ve had the first one for about 6 months so I’m not sure how it’ll be longer term but I’m really happy so far. It’s just deep enough to make a firm bed more comfortable. I’d bought an expensive new mattress that turned out to be just a bit too firm to be comfortable and this has sorted it out. Does anyone have any experience of using one of these? Reviews on the site seem very good. Not that I know of. Ask a friend, who is a member? Is there any way of buying from Costco without the £15 membership fee? I brought two yesterday in Darlington, they had another eight in a trolley near the duvets. The lady that served me at the tills said great bargain, the staff normally grab the good deals first and put them aside to pay later! Thank you. Just been and none left, guessing the woman on the till has had her break. Well done on getting a bargain. Good find, were there many left in Hartlepool? He was triggered by 3 words and probably identifies as a frying pan. Not entirely sure that was called for? But you sound like the type. paid £34 for the single last month , due to me being a cheapskate and buying a really cheap divan bed where i could feel the springs from the mattress digging into me ;( , but now with this airmax topper the bed is really comfy !, worth it. Would this roll up to some extent to put into a double wardrobe to store? Yes, it's very good. I don't hurt as much in the morning. Complaining, or the topper? Both. Thanks for the reply...is it worth it? Yes, I got mine. Have you emailed them? If they've charged you I'd complain. Never miss a 'Mattress Topper' deal again! King size Sold out annoyingly!! Thanks was literally looking for one to try. Worth a punt at this price! Agreed, but it's not buying so many things that's the problem, it's paying for them!!! There's a 12.5cm Dickens one for £26.97 (Single) too, if it helps... Dickens goose feather topper 85% white goose feather filling15% white goose down filling230 thread count2500gsm filling What is a good % down ratio? what is % of down? doubt anything decent. Looks like the price for dbl on Amazon has dropped to the Wayfair one of 26.99, but is also out of stock. Can order now and it will be delivered when available. 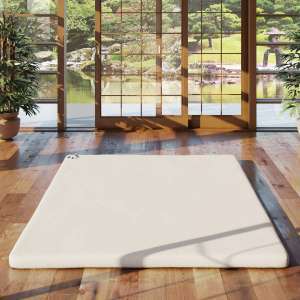 Hi the memory foam toppers will offer better support than a natural filled topper, but can also get very warm so can be difficult to live with during the summer months. 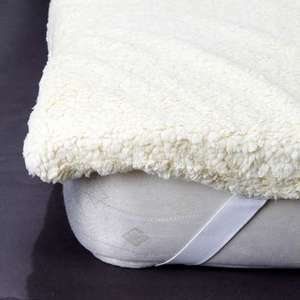 A natural topper such as goose or duck offer unparalleled softness and comfort, and great for all year round use. Plus no weird chemical smell as you get with a memory foam. Hope that helps, if you do a quick quick Google search memory v goose topper you will get a list of pros and cons for both to help you decide. Are the all gel mattress toppers better than this? 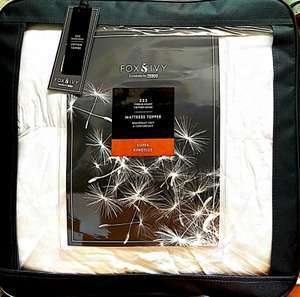 I just purchased a new king size 3000 pocket sprung with natural fillings, wool cashmere silk etc UK made for £99 delivered via eBay, unfortunately the deal has now ended. Still yet to take receipt of the mattress so can't comment on build quality, but of you search you can get a good bargain. 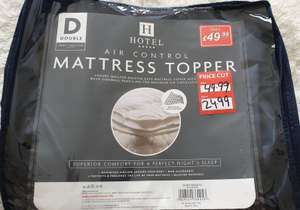 I bought the above mattress topper as I've always loved the feel of a good goose topper, when staying away in hotels, but the 100% goose down are just so expensive, even 85% goose feather 15% goose down sell for around £40- £50 mark so to find a high goose down % at this price point is a real bargain. Like with most things in life you get what you pay for. If you go into any furniture retailer and look at the high end beds from the likes of V-Spring, Millbrook, Hypnos etc. what makes them superior to the more run-of-the-mill stuff is the quality of the construction in the mattress.Typically high end mattresses will be handmade using the finest natural materials such as Egyptian Cotton, Wool and Cashmere and hand stitched. These bed types typically take around 16 hours to manufacture, usually in the UK with UK manufacturing and labour costs. But you are rewarded with a bed that has being lovingly put together, without compromise and is built to last.If you're patient, it's possible to buy such a bed without breaking the bank.A fortnight ago I popped into my local Furniture Village store and right at the very back of the shop they had a Boutique 2000 King Size Divan from The Handmade Bed Company by Millbrook. This included the high end floor standing Adelphi headboard. Normally the whole package cost £3000, but as it was the display model on clearance, we bought the whole lot for £549.00!It was in perfect condition, and I couldn't care less about the colour (Mulberry) because it was such a luxurious bed with a massive markdown.And here's the proof:Although clearance deals are available online, my advice is to make regular trips to your local store because from time to time they need to clear the space to make way for newer ranges, although in this case the bed is far from end of line.As for the mattress topper, I simply went to Home Bargains and picked up a Dreams bedding "Loved to Be Washed" 100% polyester mattress topper for £19.99 and the bed feels like marsh mallow! For comfort it does the job, but if I ever come across a 100% goose down topper at the right price I may upgrade, just for the natural materials.So now you know what to do to buy a bed worthy of HUKD! Silentnight Luxury Superspring Mattress Topper Cover kingsize.NQP@amazon sold by missdishLTD.£5.00+4.89 delivery. Snuggledown Wash and Dry Me Mattress Topper, Single@amazon prime.£12.07 prime,£16.56 non prime. Got the king size for the cheap price thanks op. Bought before oos, did not get a chance to vote. Thanks OP. My sense is that the sale discount is based on an inflated initial price, the seller supplies a brand that is available on Amazon at the reduced rates without discount, the brand the supply is called Cuddledown, their cotton sheets get poor reviews on Amazon and they are available at a lot cheaper than the my duvet and Pillow Website sells them for. Buyer Beware, I can't comment on the quality of the Duvets, they may be good value for money but I suggest shopping around. I also had same issue last night, and emailed them and ‘.. they were aware of issue with code not working, ..should now be resolved’. I just tried as a test and indeed does! Thanks That sounds promising. Been wondering whether to buy something like this to breathe some life and comfort back into our old mattress. Still seems a little pricey compared to some of the other toppers you can buy. Do you still get trial period if buying from Amazon? No idea mate. Lots of good reviews across the internet, not just Amazon. Voted the best by ideal home. The way I am looking at it is, if it works - happy days. If not then I can send it back within 30 days for a refund. I did have a memory foam mattress topper before and it was great to sleep on but then I upgraded from a double to a super king. I had the same issue. The ebay stuff is some low qaulity stuff! Maybe the smell was because it was used. I've previously bought one from ebay but wasn't that impressed and the smell of it was quite strong. May have been just my experience. Thought this one was much better and cheaper than others from the likes of eve, etc. May be look at ebay first for these as its a standard 2 inch thick topper and they should be around £25 ish on ebay. That's how much I bought one. I got 5 cm for about that price on Ebay. Not great. 2.5cm depth, I don't think so!